Coban Lookchaomaesaitong was feared for his big power and his big determination. 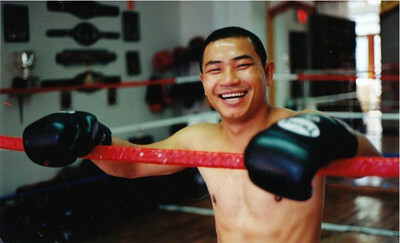 Those assets helped him beat a virtual who’s who of Muay Thai greats during the golden era of Muay Thai. Now settled in New York and teaching Coban is a well known entity among New York’s Muay Thai scene and his heart is as big as his will to win. Together with Chris Romulo and Chris Vesintin a special seminar is being held with 100% of the proceeds going towards Chris Romulo’s efforts to rebuild his gym. If there is anything about the aftermath of Hurricane Sandy that will resonate with me its how New Yorkers and Muay Thai came together to help one of their own from Take-on Promotions raffle and the early grass roots efforts of John Wolcott, producer of the fascinating Muay Thai Journal web series. On Saturday, November 17, 2012, 11:00 am – 2:00 pm this special seminar will be given by Coban, Chris and Chris. So by no means is this a donation. This is a chance to learn from great fighters with lots of great knowledge to impart. 100% of proceeds from the seminar tickets will go directly to CROM. In ADDITION, Coban’s Muay Thai Camp will donate an EXTRA 10% of each ticket sold to CROM. CROM has given us plenty of opportunity to our students and young fighters. Chris and Sarah have given Coban and Coban’s Muay Thai Camp nothing but respect. We would like to give back. You can find out more by clicking the constant contact link here. ~ by fatsoking on November 13, 2012.